The third edition of Dubai Design Week opens today with a larger and more diverse programme, strengthening Dubai’s position as a global hub for the design and creative industries. Dubai Design Week will take place till November 18 across the city with over 550 designers participating in a six-day celebration of ground-breaking design and ideas. installations to talks and workshops. Downtown Design: The commercial centrepiece of DXBDW, the fifth edition of Downtown Design will present a wide range of thoughtfully selected best-in-class established and emerging brands from all over the world to the design professionals drawn to Dubai from across the world. The region’s leading showcase of contemporary design will provide the architecture and design industry with a unique blend of exhibitors, live events, and installations along the d3 Waterfront. This year’s exhibition will showcase over 150 brands from 28 countries, featuring 90 new high-end international and regional brands. Global Grad Show: The third edition of the acclaimed annual exhibition of life-changing inventions from graduates of the world's leading design and technology universities. Curated by renowned author and designer, Brendan McGetrick, 200 innovative projects have been selected from over 470 global entries. A not for profit initiative, the Global Grad Show will welcome graduates from 92 universities to Dubai to present forward-thinking prototypes around the themes of empowerment, connection, and sustainability. This year, Global Grad Show announces the inaugural Progress Prize, which will be awarded to one exhibiting project. The winning prototype will be selected by an international jury from fields of journalism, design, manufacturing, innovation and investment and demonstrate originality of idea, social impact, international relevance and feasibility. 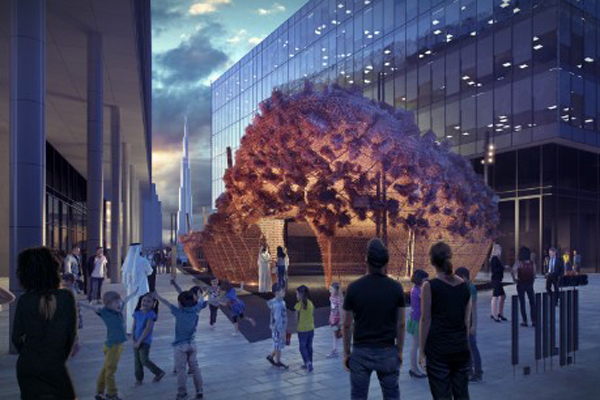 Abwab: This year’s exhibition has been designed by Dubai-based architectural studio Fahed + Architects. The structure has been constructed using borrowed and repurposed bedsprings from waste management company Bee’ah. The pavilion will house a showcase of emerging design talent from the Middle East, North Africa and South Asia (Menasa). Abwab-which translates into ‘doors’ in Arabic- invites audiences into the diverse design scenes of regional creative industries. Iconic City: Casablanca has been selected as Dubai Design Week’s Iconic City exhibition for 2017, as part of an annual exhibition series launched in 2015, which explores the culture, art and design scene of specific cities in the Middle East and North Africa. Curated by Salma Lahlou, ‘Loading… Casa’ is a simultaneous, non-linear experience, bringing together archival images, sound recordings, a short film, a monumental drawing and contemporary photography. The exhibition will comprise works by six different contributors, all from Casablanca, including interior architect Zineb Andress Arraki, graphic designer Aicha El Beloui, visual artist Mostafa Maftah, filmmaker Hicham Lasri, sound artist Anna Raimondo, and collector Mohamed Tangi.